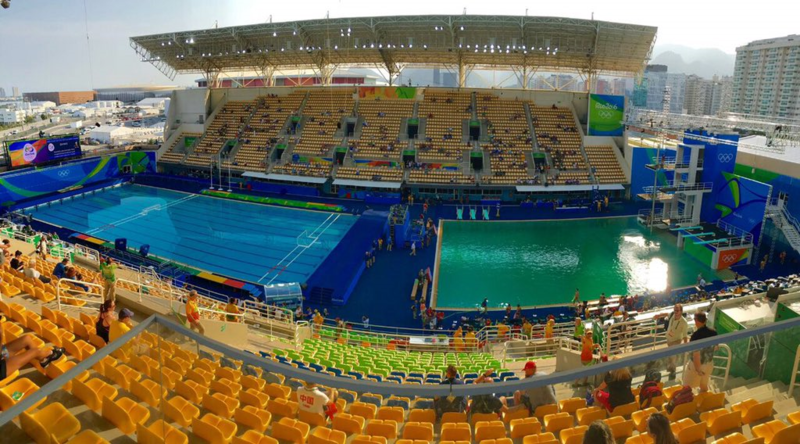 Why have Olympic pools turned green? After environmental and health concerns were raised from the pollution levels in the aquatic venues of Rio Olympic Games--Guanabara Bay, Rodrigo de Freitas Lagoa and Copacabana beach--another water-related glitch has grabbed international attention. On Tuesday, the diving pool in an open arena turned bright green, surprising sportspersons and authorities alike. The discolouration later spread to the water polo pool as well. Officials declared that the water safe for atheletes after it was tested, but other experts were sceptical. While the cause of discolouration has not been found, Rio organisers have blamed the green colour on drop in alkalinity levels. Problems in filtration of water and incorrect treatment are believed to have led to discolouration and change in alkaline levels. The international swimming federation (FINA) cited lack of chemicals in the water treatment system as the reason for discolouration. "FINA can confirm that the reason for the unusual water colour... is that the water tanks ran out some of the chemicals used in the water treatment process," it said in a statement. The contrast in the bright green against the blue was observed in two adjacent pools. On Wednesday, water polo players complained of itching in the eyes due to over-chlorinated water, a measure used to treat the discolouration. They said it was difficult to see anything in the last quarter of their match.